Emanuel Ushers In Chicago's Post-Daley Era : It's All Politics One of Emanuel's biggest challenges will be to be put his stamp on governing the "city that works" without suggesting that his friend, the former mayor, left the city in something of a mess which, according to some critics, he did. 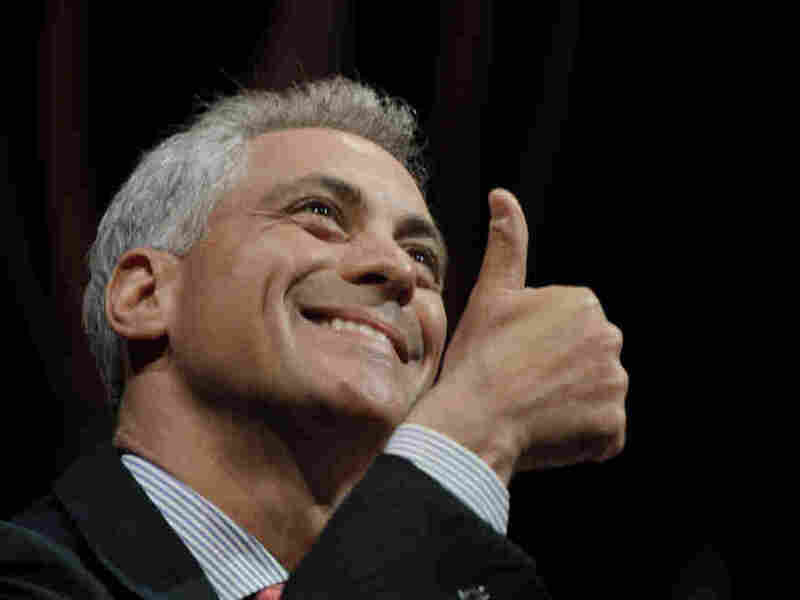 Rahm Emanuel gives the audience a thumbs up at a Chicago discussion about the impact of the arts on economic development, April 27, 2011. Rahm Emanuel has a delicate problem to navigate on becoming Chicago's 55th mayor Monday. If he were succeeding an administration of the opposing party he could, justifiably or not, blame his predecessor for all the problems he inherited. But Chicago is effectively a one-party town so that's out. Even if he were following a fellow Democrat who wasn't particularly well-liked, he might be able to blame the previous occupant of the mayor's office to some degree. But Emanuel, 51, is following Richard M. Daley, 69, who wasn't only a towering figure in American urban politics for more than two decades but a personal friend. Emanuel is even closer to William Daley, younger brother to the long-time Chicago mayor and Emanuel's successor as President Obama's White House chief of staff. So one of Emanuel's biggest challenges will to be put his stamp on governing the "city that works" without making it appear that his friend, the former mayor, left the city in something of a mess which, according to critics, he did. Daley, whose 22-year tenure made him the longest-serving mayor in city history, doesn't get all the blame, of course, for the current fiscal problems. Chicago was hit by the recession and real-estate bust like the rest of the nation and has suffered falling revenues as a result. But it wasn't just the recession, however, that put Chicago in a deep fiscal hole. In Chicago, where politics is both art and sport, how well a mayor rewards political friends and provides a high level of city services is how the score is kept. That's what guarantees loyal foot soldiers and solid re-election margins. Chicago is also a strong union city. All those attributes, taken together, would put a lot of pressure on any city's budget. Chicago is no exception. So Emanuel's administration faces a budget deficit that the departing Daley team estimated at $587 million. Emanuel and his people are saying the deficit could actually be higher which isn't surprising since 1) human nature causes exiting administrations to invariably understate financial problems and 2) it's in an incoming administration's interest to give a bleaker picture to gain more leverage in union negotiations (though it gives municipal bond holders heartburn.) The more pessimistic estimate also gives a new administration some political upside in case its estimate proves to be too high. I have a tremendous amount to learn from his successes and how he achieved them. It doesn't mean there aren't things I'm going to do different. On "Day One," he will put a freeze on just about everything but paychecks and bills coming due. That will help fulfill his pledge to cut $75 million fromMayor Richard Daley's last budget. Another thing Emanuel intends to do "different" than his predecessor is to seek more organic answers to the city's budget problems than the piecemeal, lawn sale approach was prone to. For instance, Daley caused an uproar in 2008 when he struck a deal to lease for 75 years Chicago's 36,000 parking meters to a partnership managed by Morgan Stanley. The city received $1.15 billion through the arrangement. But the Morgan Stanley partnership which includes the Abu Dhabi Investment Authority and Allianz Capital Partners could earn $11.6 billion from the deal, according to Bloomberg News. So Emanuel will be looking to go where Daley couldn't, making significant cuts to the city's payroll costs and reining in its bloated City Council bureaucracy. "It's hard to see how the city closes a deficit ... without reducing payroll," Msall said. Clearly, the job of being Chicago's mayor right about now isn't for the faint-hearted. There may not be blood but there will most assuredly be pushback and blowback as city workers lose jobs and take paycuts. But while he has been accused of many things, faintheartedness isn't among them. In any event, Emanuel's accession to the "fifth floor" of City Hall, as the mayor's office is known, should bring a new style to city hall, if nothing else. And I just don't mean all the expected swearing and table pounding. Daley was viewed by many as running the city like an imperious ruler, part of a dynastic tradition extending back to his father, the original Boss. His father, Richard J., would have no doubt been proud of his son's decisiveness. Like the time he famously ordered bulldozers to destroy, in the middle of the night, Meigs Field, the downtown airport which he wanted for a lakefront park over the objections of opponents who liked the airport's convenience. The words "fait accompli" may not have been ones Daley the junior (or elder for that matter) might have readily used in conversation but they were masters of the tactic. Emanuel won't have the Daley name and legacy to awe Chicagoans into submission, meaning he'll have to prove himself initially a lot more than his predecessor ever did. Wiry, energetic and congenial, he showed he was a skilled politician during the mayoral campaign, able to backslap and chat up constituents with the best of them which was no surprise to anyone who's followed his career. Emanuel essentially does whatever it takes to get the job done, whether that means turning on the charm or twisting arms. He'll get lots of opportunities to do both in Chicago. Perhaps one of Emanuel's greatest challenges will be to leave a mark on a city that's so associated with the Daleys. From the skyline to public spaces to the Chicago Public Schools, the Daleys have reshaped Chicago in ways in enduring ways. Even on the day Emanuel ushers in the post-Daley era, you have to wonder if he will leave a lasting imprint, too, on one of the world's great cities and, if so, what will it be?